For the modern contemporary home, Bontrager's Bedford Amish Dining Table creates the perfect space for both everyday and formal dining needs. With its sleek, clean appearance and beautifully curved pedestal base, the Bedford is versatile enough to complement your kitchen or informal dining space well while also providing the opportunity for formal dining. Available in several sizes with the option of an 18" butterfly leaf for additional seating space, this dining table can be placed in various sized dining areas for dinners and gatherings of many sizes. Add this table to a current set of dining chairs, or pair them with a set of new chairs for a new dining set. It is guaranteed to provide a warm and comforting place to gather for generations. The dining room table of your dreams is ready to be created. 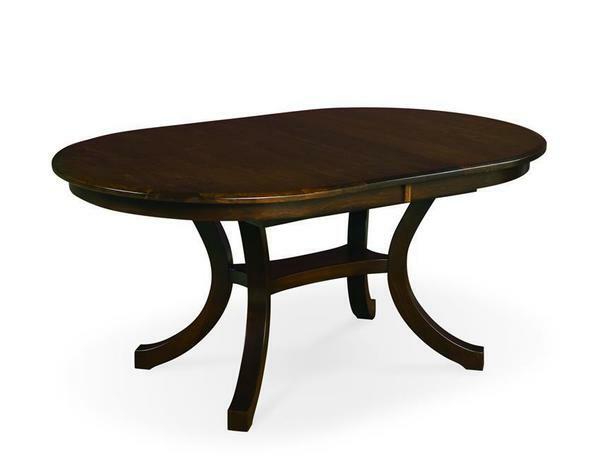 Order online, or contact a DutchCrafters to speak with an experienced furniture specialist to begin creating your new Bedford dining table today!